Quantitative determination of α-tocopherol and quality control studies in Sarcopoterium spinosum L.
Essential Oil Compositions and Antimicrobial Activity of Piper arborescens Roxb. Ethnomedicinal survey of plants used in the treatment of female ınfertility in Chanchaga Local Government Area in Minna, Niger State, Nigeria. Investigation of Antioxidant and Enzyme Inhibition Activities and Phenolic Compound of Medicago rigidula (L.) All. Chemical composition and larvicidal activity of essential oils from Nepeta cadmea Boiss. 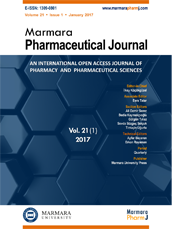 and Pimpinella anisum L. on the larvae of Culex pipiens L.
Biological activity and chemical composition of the essential oil of Nepeta cataria L.